SE3 tag by Eric Haze, done for Jay “J.SON” Edlin at the Mudd Club during the “Beyond Words” show. Scan courtesy of Jay “J.SON” Edlin. One night artist and curator Jane Dickson and her husband filmmaker Charlie Ahearn were planning to go out to the Mudd Club, which would eventually become one of the hippest clubs in New York City. Dickson had been procrastinating throughout the day and had not gotten much painting done. Around 9:30pm, she finally herself sat down and told herself that she was going to paint no matter what. But Charlie was insisting that they go to the Mudd Club. Dickson protested that she couldn’t go, that she had to work. Really, she wasn’t yet a fan of the club and was just trying to avoid it. That’s when, according to Dickson, Charlie said “Jane, this is work,” and they went to the Mudd Club. It’s fortunate for Dickson that Charlie was so persistent, because he wasn’t wrong, and their time socializing at the Mudd Club and at other events with the Downtown crowd helped to land Dickson one of her first shows, in an exhibit at the Mudd Club curated by Keith Haring. The Mudd Club was also where Dickson and Charlie ended up getting to know many of the cultural icons who would become their friends, people like Haring, Cookie Mueller, Glenn O’Brien, David Wojnarowicz, Jean-Michel Basquiat and Patti Astor. Thinking back on the experience, Dickson says, “Art happens in the mix more than we usually imagine and less in isolation, and we were part of that mix.” Now, it may be possible to be part of that mix without ever leaving your bedroom thanks to sites like Facebook and Twitter, but in 1980 being in that mix meant you have to be seen and be out at places like the Mudd Club. While it is perhaps unfair to let the Mudd Club be the defining spot for the Downtown scene of the late 1970’s and early 1980’s, as if there weren’t other clubs and bars that were frequented by the artists and other creative-types who made up the Downtown scene nicknamed the Downtown 500, I have chosen to focus on the Mudd Club because it was one of the core clubs in the Downtown scene, it had the most connections to street art and graffiti, and it exemplifies so many of the features that made those clubs and bars interesting and useful to artists. The club opened in 1978 and was founded by Steve Mass, Diego Cortez and Anya Phillips. Over its five-year run, the club hosted performances by musicians and poets including Allen Ginsberg, Talking Heads and The B-52’s, and was frequented by cultural figures such as Basquiat, Madonna, David Bowie and Andy Warhol. Around 1980/1981, Mass began getting some of the employees from Club 57 to work at the Mudd Club instead, hoping to give his spot a cooler vibe like that at its competitor Club 57. One of the people he brought over was Haring, who had been curating shows at Club 57 and was put in charge of the Mudd Club’s new art gallery on the 4th floor of the space. Among the shows Haring put on at The Mudd Club was Beyond Words, which he invited Fred Brathwaite aka Fab 5 Freddy and Leonard McGurr aka Futura to curate. The show included works by John “Crash” Matos, Rammellzee, Eric Haze, Zephyr, Lee Quiñones, Basquiat and many others. 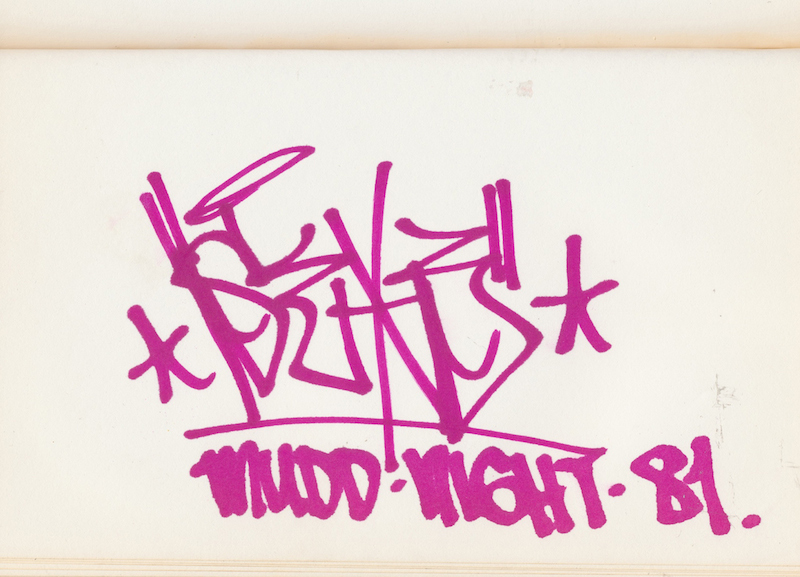 When Beyond Words opened in April of 1981, it connected the downtown scene with the uptown (graffiti) scene, and Steven Hager gave the show a favorable review in the Daily News. Many of the graffiti artists in Beyond Words had never been to The Mudd Club before. Through Brathwaite and McGurr, Haring had been inviting the people he know from the uptown scene to Club 57 and the Mudd Club before Beyond Words, but even most of them had not been showing their artwork in the area and only a handful were regulars. With Beyond Words, the importance of the show was as much, if not more, about having the downtown crowd see the work of these graffiti writers as it was about getting the writers to check out the club. Beyond Words also marked the first time that a South Bronx hip-hop show was seen downtown, with Afrika Bambaataa performing on the show’s opening night. Haze thinks that the importance of Beyond Words “was more the fact that the show itself happened. I don’t have any clear memory of the artwork being outstanding. But that show provided credibility and an entre into a new world.” Haze had already been hanging out at the Mudd Club, but Beyond Words was evidence to the other patrons that he, and graffiti, had arrived. While many of the artists in Beyond Words had also been included in Cortez’ show New York/New Wave at PS1 in February of 1981, Cortez’ show was a massive affair with over 100 artists and 10 times as many artworks where, of the graffiti artists, it was really only Basquiat who made a strong positive impression among reviewers. New York/New Wave had the potential to bring a number of graffiti artists into the limelight, but for most of them it came down to a brief taste of the art world and the bragging rights to say that their work was hung next to Andy Warhol’s photographs. At Beyond Words, Haze, Quiñones, Lady Pink, McGurr, Dondi White and everyone who was in both shows (besides Basquiat) finally got their chance to shine. Sure, the crowd the Mudd Club was smaller than at PS1, but the Mudd Club had the hippest crowd in the city.